The talented midfielder, who netted 10 league goals in the Waterside club’s title winning campaign, is believed to have meet Lurgan Blues’ boss Gary Hamilton. If Niall gets that opportunity to sign for a club who are playing European football and challenging for the Premiership, then he goes with our blessing. ’Stute manager Paddy McLaughlin is resigned to losing one of his star men, who played a major role in the club’s recent Championship title success. 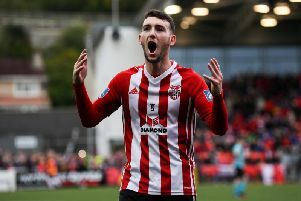 “If Niall gets that opportunity to sign for a club playing European football and challenging for the Premiership, then he goes with our blessing. “It will be loss to us if Niall goes but we’ve had big losses in the past and have always come through. It’s just another opportunity for one of our young players to step up. “We lost Stevie O’Donnell, our captain and a player who had a massive influential, and we replaced him with Skinny (Caoimhin) Bonner who has been phenomenal for us this season. “We lost Jamie McIntyre but we have seen the likes of Ronan Wilson and Callum Moorehead emerge this season on the wings. We lost Darren McCauley a few years back as well but, yes, if Niall goes to Glenavon, it’s a big loss. Regardless of Grace’s furure, McLaughlin is already planning for next season as he looks to strengthen his squad. “We have full faith in what we have but you always want to strengthen. It’s great to get all the pats on the back after what we achieved last season but we are always on the look out for talented players that can add to what we already have,” he added. “That will never change. We have been like that since I’ve come in as manager. I will keep watching matches and looking to see if I can get someone who benefits the squad.